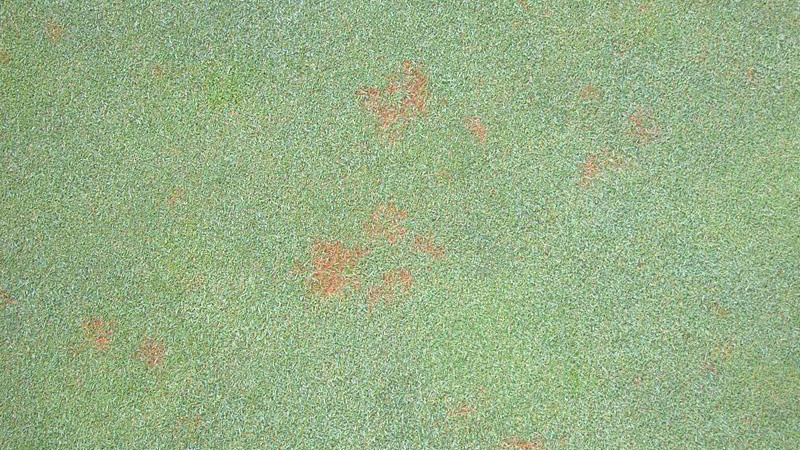 Red leaf spot is a disease that occurs on creeping bentgrass during warm and wet weather in the spring, summer, or fall. Red leaf spot is a ‘Helminthosporium’ disease, which is a complex of diseases caused by fungi that produce large, cigar-shaped spores. 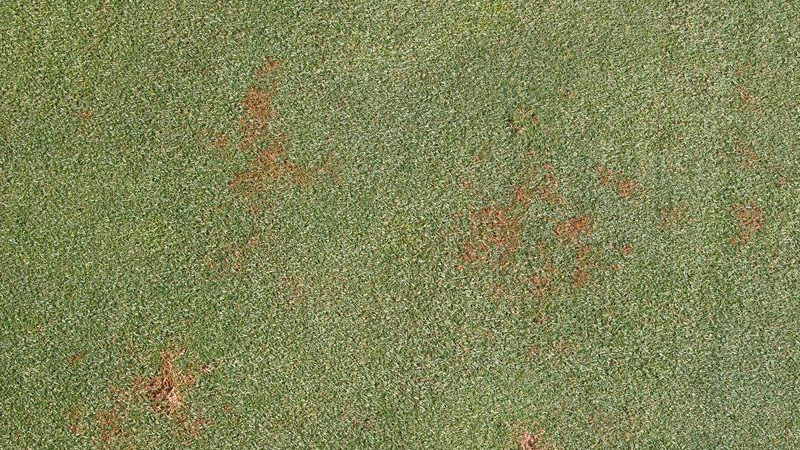 Symptoms of red leaf spot appear in spots or irregular patches that are red or reddish-brown. 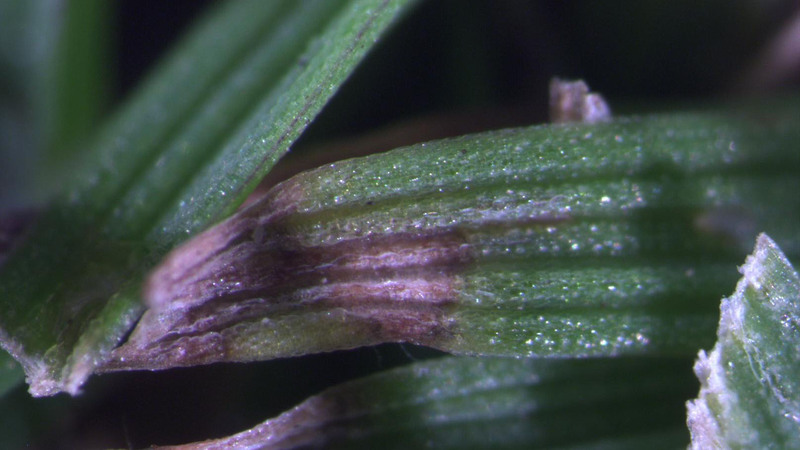 On individual plants, symptoms appear as small, red or reddish-brown leaf spots with a tan center. As the lesions expand and coalesce, the turfgrass leaves become blighted and collapse to the ground. 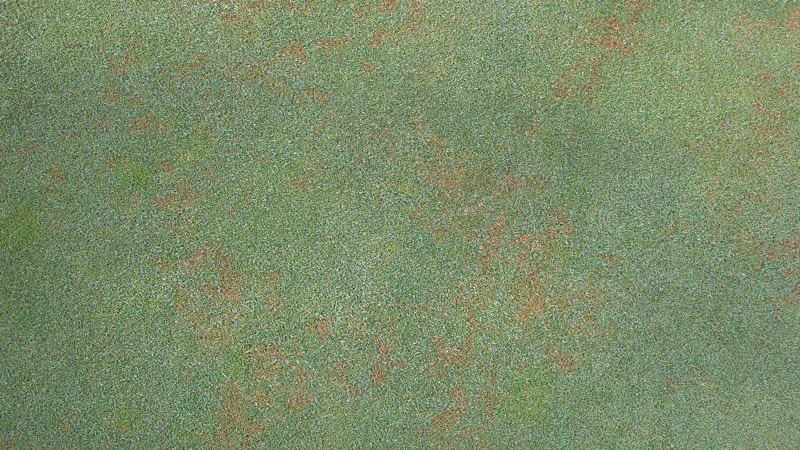 Red leaf spot is one of several Helminthosporium pathogens that survive in the thatch during periods that are unfavorable for disease development. 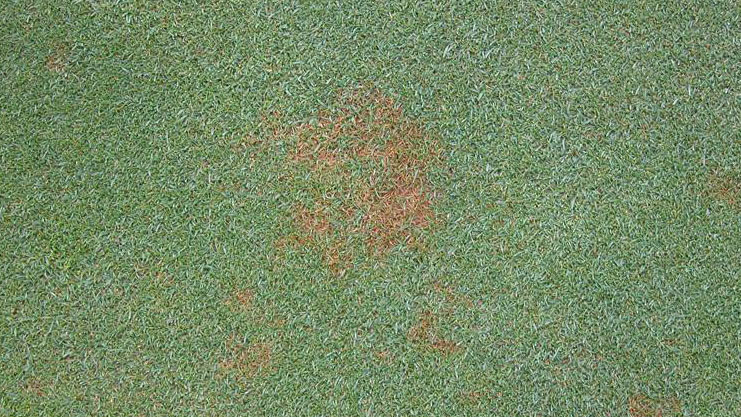 The red leaf spot pathogen is most active during warm, wet weather in the late spring, summer, or early fall. 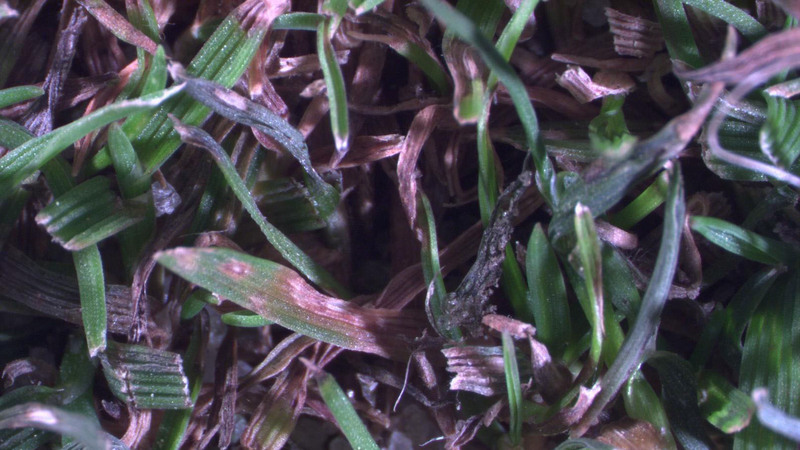 Red leaf spot is most severe on turf that is growing slowly due to adverse weather conditions or improper management practices. Shaded areas with little or no air movement result in weak turf and extended periods of leaf wetness that favor disease development and plant infection. Deficient or excessive nitrogen, excessive thatch, extended periods of leaf wetness, drought stress, and low mowing heights are factors that encourage the development of Helminthosporium diseases. 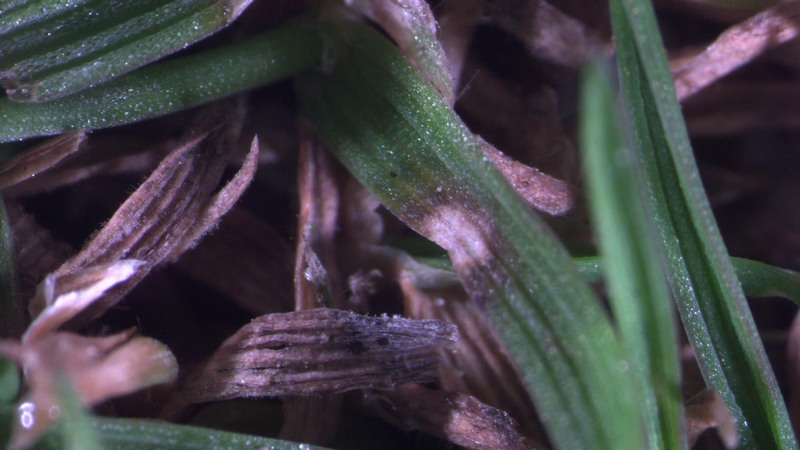 Certain cultivars of turfgrasses are very susceptible to injury from Helminthosporium diseases while many of the newly released cultivars have exhibited good resistance. Fertilize to meet the nutritional needs of the turf but avoid over-stimulation and the development of lush, succulent growth. Do not apply more than one pound of nitrogen per 1000 square feet in a single application. Creeping bentgrass should be mowed at heights between 0.110” and 0.125” during fall, winter, and spring and greater than 0.125” during summer. Keep the mower blades sharp to prevent open wounds through which the fungus can enter. Reduce extended periods of leaf wetness with deep and infrequent irrigation, wetting the entire root zone then re-applying when the root zone becomes dry. Do not irrigate just before sunset or after sunrise and remove dew in the morning to shorten leaf wetness periods. Remove unwanted vegetation that impedes air movement and prune trees to increase light penetration. Regular aerification and topdressing is needed to reduce thatch accumulations and minimize pathogen survival. 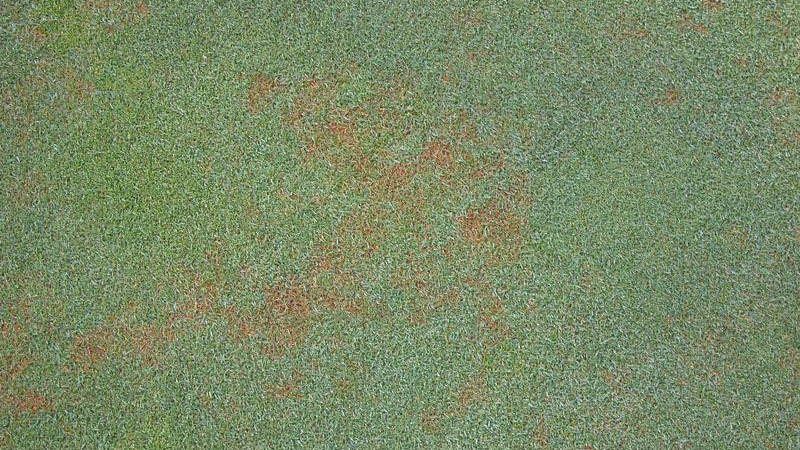 Red leaf spot can be controlled on a preventative or curative basis. Where the disease has been a persistent problem, apply an effective fungicide every 14 to 21 days when conditions are favorable for infection. Once the symptoms of red leaf spot appear, tank-mixtures of contact and systemic fungicides are recommended for curative control. Figure 1. Red leaf spot host species. Figure 2. Red leaf spot host species. Figure 3. Red leaf spot stand symptoms. Figure 4. Red Leaf Spot stand symptoms. Figure 5. Red leaf spot stand symptoms. Figure 6. Red leaf spot stand symptoms. Figure 7. Red leaf spot stand symptoms. Figure 8. Red leaf spot foliar symptoms. Figure 9. Red leaf spot foliar symptoms. Figure 10. 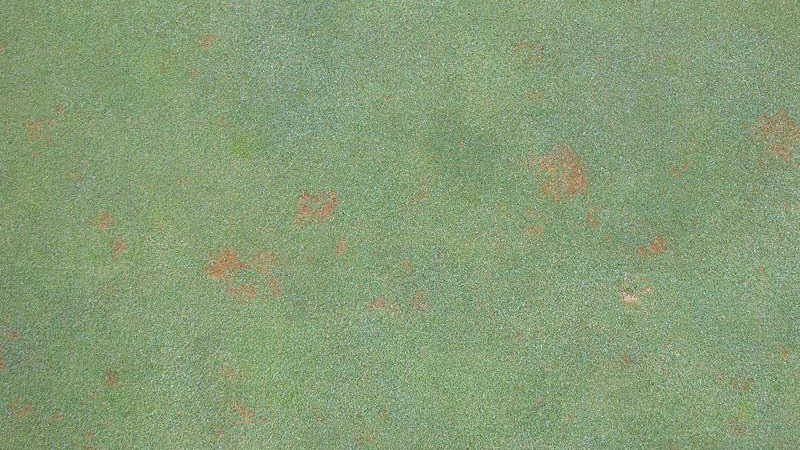 Red leaf spot foliar symptoms.